To complement Mystery Picture no. 70. This print has Tidey's stamp on the back and appears to have been taken at the same time if not on the same occasion as no. 70, because the work on the track appears to be in the same state. 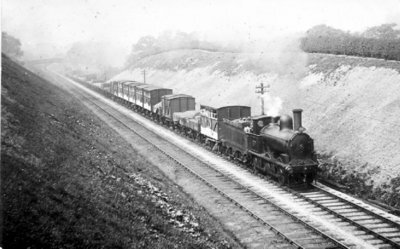 The goods train is pulled by a 17in Coal engine, which has a diamond headboard. The date is perhaps round about 1900 (or mid 1895-1902). The only possible view I can see in the Tidey list is only described as "0-6-0 on Goods" - not very helpful. It is also shown as being a copy but he did copy some of his own pictures. He is a hard man to tie down. In 1949 in the intro to My Best Railway Photographs the heading is 'Forty-two Years of Railway Photography', and he states that his collection of negatives goes back as far as 1906, so from this the 1890s seem to be ruled out for pictures of his own taking. But, in 1954 in Those Were The Trains he states that from about 1900 onwards he made a week each year for railway photography trips, and in the final paragraph says "I am the only one who, starting in the 1890s, is still carrying on....". It is interesting to note that his trips started when he was 21 - maybe he was not allowed to do so earlier. His numbering of negatives did not start until around 1906 and it seems that any earlier pictures that survive may be copies. Does it rule out pictures from the 1890s for he was born in 1879, so may have started as a teenager but probably only on family holidays? Numbers for copy negs are prefixed 'C', trains 'T' and locos and some other views 'S'. 'A' indicates Acquired - sources not known. These numbers, which are on the negatives, only appear on cards he printed himself or that were done by B & R in London, in both cases in pencil on the back. None of which helps with the location which does not tie in with any of his regular places. "PHOTOGRAPHS OF LOCOMOTIVES AND TRAINS. Specialities: G.N.R., S.E.R. and L.C.D.R.. Prices: Cabinets, 6d. ; Cartes, 3d. ; plus postage. Selections on approval. - Apply, by letter only, to H.G.T., 45, Queen Elizabeth's Walk, London, N."
"RAILWAY PHOTOS. - East Coast down Scotsman passing Harringay, engine 34; West Coast Ditto, passing Bushey, engines Snowdon and Centurion; L.& N.W.R. 2-45pm up, engine Irresistible. The above and many others can be had as Cabinets or Cartes. Cabinets, price 6d. ; Cartes, 3d. Selections on approval. - Apply, by letter, H. G. TIDEY, 3, Pentonville Road, London, N."
This debate has been adjourned to the society's forum because of the links with Mystery Picture no. 70 and the submission of further photographic evidence.